Systems are part of what helps us in planning and trying to keep an even keel in the garden. Or at least minimise the damage when we get busy with other things. Edges to the vegie beds- grass barrier formed by double rows of bricks and mulch is very easy to mow or whipper snipper up to. 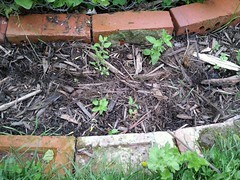 and planted with oregano/ marjoram in some places as an experiement to act as a green barrier. Rabbits get selected greenwaste including twiggy prunings and things like couch grass and dandelion roots because they transform them into manure without the danger of spreading weeds further. 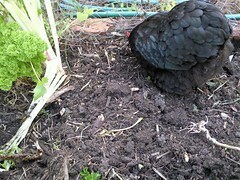 Chickens get the kitchen scraps and bulk greenwaste especially that with seeds or flowers about to seed. They eat some, kick around the other bits and mix it all with chicken manure and straw. Perfect compost making ingredients. 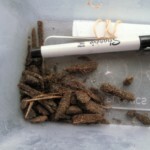 Worm farms get some kitchen scraps – things like bulk apple cores and skins from bottling, or overgrown zucchinis that the chickens will just kick around. 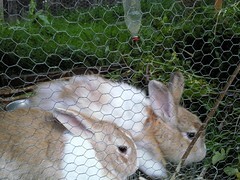 Rabbit manure is also a favourite ingredient to the worm farm mix. 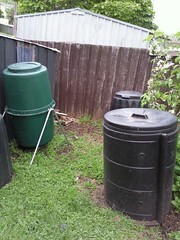 - Compost area with multiple bins. We are now up to 7 I think. 4 regular ones, and 3 tumblers. The favourite tumbler is the one in this photo below. - heat mat in laundry – don’t use this as much as I used to, since Chris started Hobart Kitchen Gardens and sells wonderfully healthy and interesting seedlings at the FarmGate Market. 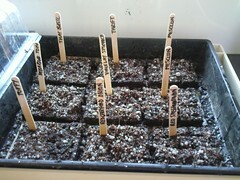 - greenhouse for young plants and tomato race contenders. This greenhouse is tucked in under the back stairs and enclosed with laserlite. When we had the stairs built, this space underneath was perfect for a short person! - soil blockers for seed planting. It’s all about maximising the return of investment of time and energy. 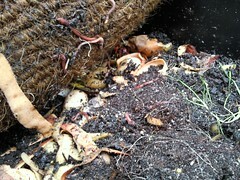 For example, the compost is just outside the chook shed. The wheelbarrow can fit in the chook shed door, and the chooks kick and scratch the greenwaste and straw downhill. We can go to the greenhouse easily off the deck – so we can pick herbs in our socks if needed. When the aquaponics are up and running the growbed will be in the greenhouse, making this even better. I've been working out what we will plant for the main summer vegie garden, and finally doing something I've been thinking about for a while – plotting combinations of vegies that are reasonable companions, also allowing for a record so I can do some crop rotations into the future. I'm not going to call them guilds as that seems to imply a greater degree of combination, multiple families, and wisdom, ha! 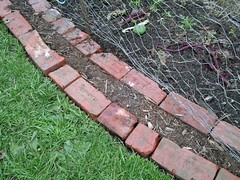 I've separated out the climbing and bush beans so that it is easy to allocate to a space with trellis of some kind. Lots of carrots to ensure supply through the seasons. My goal is not to plant everything all at once as that would mean everything ripening at once also. This plan will get tweaked further – I noticed this morning that the Lost Seed packets have good/bad companion information listed on them too, including many more herbs than I have listed. The other thing I noticed this morning is that the only seed I now need to buy will likely be Corn, everything else seems covered. Last weekend we put in the star pickets for the fruit trees in the driveway and front gardens, and this weekend finished the job. After memories of arguing with wire in past efforts I was surprised at how easy the job with the right materials, including tensioner doohickeys. Having squished 8 apple and pear trees across the front fence, they most definitely needed a decent espalier, and the side fence plantings also did. We ran a string line through the middle of the star pickets to make sure that lines were straight and this is a trick we'd repeat again. 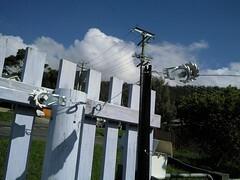 On the inside of the front fence we have wooden posts so we just attached eyelets directly into them to run the wires through. 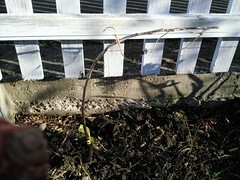 Bending over the trees to tie down to the wire was nerve wracking after my "attack" on the nashi pear left me ubercautious. But we were very pleased to be able to follow the guidance from Woodbridge Fruit Trees and we're looking forward to enjoying the ground work we've down this winter for many years to come. Weeded C6 and mulched with horse manure to add more organic matter in prep for summer vegies. 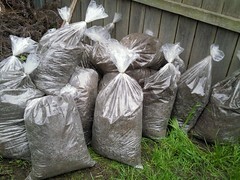 Cleared out the rabbit cage and now have a stash of lovely compost booster. 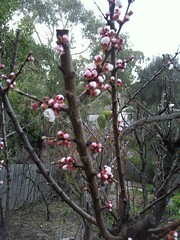 Admired the leaves emerging on the blueberries and the blossom on the apricots. We're debating what to do with the front of the deck. We had been thinking of putting an aquaponics system there (fresh rainbow trout anyone?) 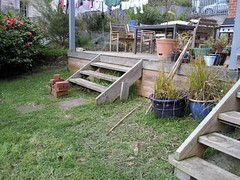 and then thought in the shade near the side fence might be better, leaving the front of the deck for a combo winter cold frame/ extra summer outdoor rabbit run. We've now come full circle and it really is the best spot for the aquaponics. 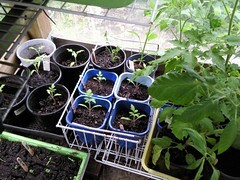 And through winter we can erect a greenhouse style shelter over the aquaponics growbeds to achieve the cold frame idea. But the rabbits enjoyed their time out this weekend so much I'm wondering about more space for them to run around without having to be with them all the time. It doesn’t feel right not to do any gardening on a weekend, even if the whole house has the plague sorry, flu. 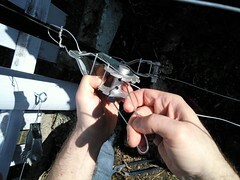 The greenhouse provides a spot out of the wind, and in the late morning at the moment has direct sun as well. Admittedly some of the packs were rather ancient but you never know, I sowed generously to compensate. It saves the packs sitting there in the seedbox. Note to self – do not buy Amgrow Premium Seed Raising Mix again, this bag had great lumping pieces of wood chip in it. 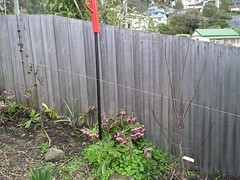 The other garden work I did this weekend was figuring out where the fruit trees (19! eek!) we have ordered are all going. As this involved sitting in bed with a cat it was very pleasant gardening. Across the front fence – 8 alternating dwarf apples and pears. On the side fence with Mary – two plums. Arranged somehow in the middle of the front garden – a fig and three dwarf apples sited to accommodate the magnolia, power line to the house, and two dwarf cherries already in place. The front garden is going to be a delicious forest of fruit come summer time. Over the back fence – two quinces, a kentish cherry, an almond, another apricot and one dwarf apple. We have placed the four closest to the road as the least attractive to eat off the tree – quince, kentish cherry and almond. The neighbourhood kids will have to scramble through those and down the slope to get at the apricots and apples which are against the fence. There’s enough to share anyhow. At this time of year I love watching the honeyeaters and other birds coming to feed on the apples I purposely leave on the tree for them. We don’t get possums or cockatoos being down in the valley so we can ‘share the surplus’ with the more delicate birds. Now the kittens are killers though the leftover fruit needs to be high up, not near the ground. Harvest – the first lettuce from the hotbox! delicate and sweet. The rabbits are working their way through last weekend’s prunings. They are quite methodical. If there are leaves on the tips they eat those first. On the second pass, they eat all the little nubs on the branches where the leaves/flowers will sprout from. On the third pass they eat the soft tips of twigs, and last but not least they carefully strip the bark from the woodier bits. And they turn their nose up at Apricot prunings, and do little happy rabbit nose twitching for Pear. Too cute. Last weekend – pruned anzac peach, plum, granny smith apple, gala apple, williams pear. Robin kept up work on the reshaping of the clothesline mound, we think we’ve figured out how to hold back the slope from the depredations of chicken scratching – using the off cuts from the chicken shed as small terracing bits. I potted on the remainder of the strawberry plants – now we have about 200 plants in our strawberry nursery, good for filling the gaps in the front garden. Meatballs I did two weeks ago were magic for dinner one night this past week. They will be repeated. A number #20 jar with 20 meatballs was an ample feed for the three of us with extra passata over the top. Also a success – salsa soup – make a vat of regular vegie soup and toss in half a jar of salsa #3. Yum. Notes for next winters harvest. At the moment we are mainly buying: potatoes, spinach, leeks, red onions, cabbage, sweet potato. We have enough from the garden of carrots, beetroot. Not quite enough broccoli – i think the seedlings may have suffered and production has not been good.